Posted in News on July 28, 2014 by Lak. 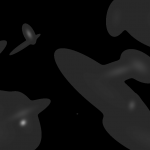 w2segmotion is also used to estimate motion from clusters, so as to create image nowcasts (using w2advector). Adding storm attribute generation makes w2segmotion a performance hog in real-time applications. Storm tracking should not be limited to w2segmotion’s way of identifying clusters. Any object-identification method (not just the enhanced watershed approach we use) should be supported. Following the WDSS-II philosophy, therefore, the cluster-table functionality of w2segmotion has been split off into a new program called w2clustertable. Instead of providing the -X option to w2segmotion, pass the XML file into the -X option of w2clustertable. w2clustertable also takes, as input, a label grid (the “KMeans” output of w2segmotion) and motion estimates (the Motion_East and Motion_South) outputs of w2segmotion. But you could also use w2imgmotion to obtain cross-correlation-based motion estimates. And you can use any scheme to create a labeled set of storms (1,2,3…) to get their properties. It is not necessary for storm#4 in one frame to be storm#4 in the next frame (i.e., w2clustertable will associate storms using centroid-match or overlap or one of several built-in association methods). 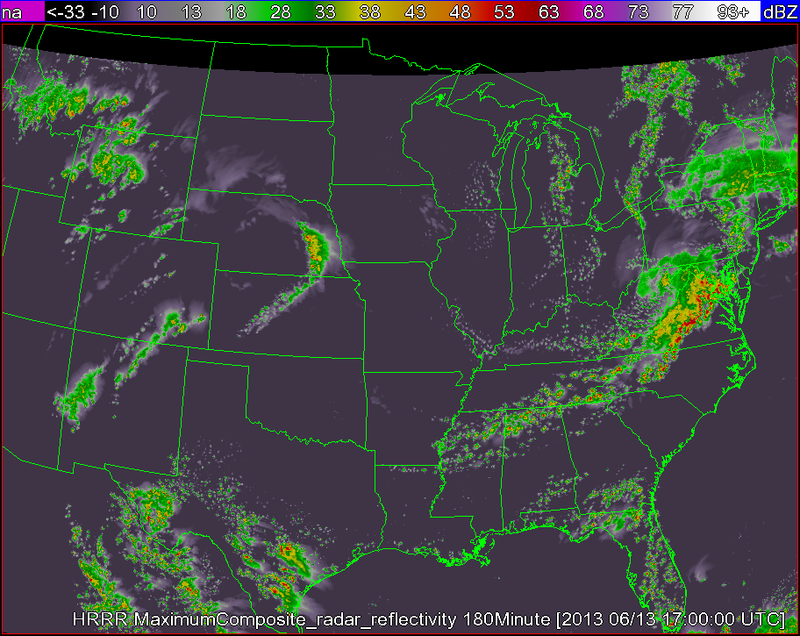 w2segmotionll uses K-Means clustering and Enhanced Watershed to identify storm cells at multiple scales. w2segmotionll and w2clustertable can both be used to track storm cells over time (see: V. Lakshmanan and T. Smith, “An objective method of evaluating and devising storm tracking algorithms,” Wea. Forecasting, vol. 25, no. 2, pp. 721-729, 2010. ), but w2clustertable is now preferred. w2flatten will take the multiscale cluster table output by either w2segmotionll or w2clustertable and “flatten” it into a single table, to make multi-scale data mining possible (forthcoming paper by Humphrey, Lakshmanan, Smith, Smith and Thompson). Once downloaded, untar and unzip any files if necessary. Then same as mentioned above organize the files so that only the files you actually need are in a directory. I recommend reading the “quick usage” guides that are available via the WDSS-II website, or typing just the command into the terminal to see the other flags that can be passed. Below explains only the flags which we used. The command needed to convert the NEXRAD data to WDSS-II NetCDF is ldm2netcdf. An example of the command issued is below. –o = the output directory (where you want your now NetCDF files to go, if directory does not exist, one will be created for you). Use replaceIndex to create the needed configuration file code_index.xml. In this step we will De-alias the radar velocity data. The command used in this step is “dealias2d.” Here is an example of the command issued. –o = should be the same output path as used above in ldm2netcdf. Run replaceIndex on the code_index.fam directory in your NetCDF output directort. The command issued should be identical to the command issued after running ldm2netcdf. This will update the configuration file so it contains the newly de-aliased velocity data. This step will run Quality Control (QC) tests on the radar data to eliminate any noise and clutter. There are two different commands that can be used, and it depends on whether or not your radar data contains dual-pol. QC the radar data using w2qcnn if you are using radar data that does not contain dual-polarization information or use w2qcnndp if using data that does contain dual-polarization information. –o = path to the output file directory, should be the same output path as used above in ldm2netcdf and dealias2d. Run replaceIndex on the code_index.fam directory in your NetCDF output directort. The command issued should be identical to the command issued after running ldm2netcdf and dealias2d. This will update the configuration file so it contains the newly QC’d data. To start, the first steps require the requesting, and downloading of large datasets. This process can be time consuming in both waiting for the NCDC order to come through, and also in downloading the data. After downloading the needed RAP data, organize the data into directories so that only the times you want processed are in a directory. The WDSS-II program reads in whole directories worth of data at a time. So to minimize the processing time, and also the size of your data, only keep the data need for the time of interest. Utilities such as wgrib or wgrib2, available from NCEP, are particularly useful for this task. There are two different processes for grib1 data and for grib2 data. Typically, RAP data will be in grib2 format and RUC data will be in grib1. In order for WDSS-II to read in RAP/RUC data, it needs to be in the WDSS-II NetCDF format. Below are the steps needed to convert both GRIB 1 & 2 to the required format. –i = input directory of the GRIB 1 data. –o = where you want the generated NetCDF files to go (creates directory if it DNE). –k = tells command NOT to delete the original GRIB 1 files after processing. –a = if on, will read the existing files in the directory on startup. -1 = if on, will execute just once (not real-time). –t = the northwest corner of the domain you wish to use (Should be same as below with w2merger). –b = the southeast corner of the domain you wish to use (Should be same as below with w2merger). Run “replaceIndex” to make a .xml file from .fam directory. The code_index.fam will be the same as the outputDir specified in the griddataingest.xml file you copied over and edited. –i = input directory (path to code_index.fam/) of now WDSS-II NetCDF files (same as output directory used above in gribToNetcdf ). Run “nse” to create various products that RAP/RUC does not have, but which WDSS-II needs to interpolate to the various Isotherms in the RAP/RUC data. After converting to GRIB 1, revert back to the previous section for converting GRIB 1 to WDSS-II NetCDF. For GRIB 2, use the WDSS-II Java package to convert GRIB 2 to WDSS-II NetCDF. In steps (a.) and (b. ), make sure the proper paths are declared. Next you need to copy the file wdssiijava/example/griddataingest.xml into a directory of your choice, and rename it rap.xml or ruc.xml (any name .xml works). Next, edit the newly copied .xml file. At the top of the file change the inputDir to where your data are, and outputDir to where you want it to go. Also change the filenamePatterns to match some part of your input files (if all files start with rap_130… you would use rap_130 as your filenamePattern). You also will want to uncomment the listVariables entry and set it to true. This will create your configuration file, varList.xml. This file contains all of the meteorological variables in your RAP/RUC data. By editing this file you can change which variables are processed in the new NetCDF files. Next, edit griddatasetingest.xml that you copied and renamed so to set listVariables to false. –i = input directory (path to code_index.fam/) of now WDSS-II NetCDF files (same directory as outputDir mentioned above). The process of obtaining data from multiple radars, quality controlling the data, merging the various radars to a common three dimensional latitude and longitude grid, and then interpolating that radar reflectivity to the -10˚C level found in RAP/RUC data is explained here. This process was conducted and then this document created by Bryan Burlingame (burling6@uwm.edu) and Dr. Clark Evans at the University of Wisconsin-Milwaukee for the purpose of identifying Convective Initiation (CI) in hours immediately following Mesoscale Predictability Experiment (MPEX) research flights. Thanks to Bryan for sending me these instructions. Posted in News on April 28, 2014 by Ben Herzog. Determining how closely a forecast matches what happens in reality is a crucial step in the evaluation of any type of forecast. Gridded forecasts, which are of particular interest to WDSS-II users, are no different. With this in mind, we will cover a method in WDSS-II to compare gridded forecasts to gridded observations. To make this comparison, we will make use of the algorithm w2scoreforecastll, which creates scores for the gridded forecasts based on how well they match observations. More generally, w2scoreforecastll is used to compare two supposedly equivalent 2D fields (e.g., a forecast field and an observation field). The algorithm quantifies just how different the two fields are through an error score. When the error score is low, the two grids match well, meaning that the forecast did a good job of approximating reality. In many instances, the best option for scoring gridded forecasts is option number 3, Gaussian Mixture Models. This method is outlined in great detail in V. Lakshmanan and J. Kain, A Gaussian mixture model approach to forecast verification, Wea. Forecasting, vol. 25, no. 3, pp. 908-920, 2010. In a nutshell, this algorithm approximates both the forecasted and observed grids with a mixture of Gaussians. Based on the parameters of these Gaussians, the algorithm computes 3 different measures of error: 1) translation error, 2) rotation error, and 3) scaling error. These errors are then all incorporated into one measure of error for the forecast, the combined error. These error scores are computed at 8 different spatial scales. At the coarsest scale, the grids are approximated by just 1 Gaussian. Then, at subsequently finer scales, the number of Gaussians used to approximate the grids increases roughly exponentially to about 128 Gaussians at the finest scale. Be sure that your input index is pointing to both the forecast (HRRR) and observed (radar) fields. The algorithm will then take all 180 min HRRR forecasts, as well as all of the radar observations, and approximate those images with Gaussians, as shown in the figures below. The algorithm will then generate error scores for corresponding HRRR and radar grids and output the scores to the file specified in the -o option of the command line. *Note: It is important to be sure that the domains of your two grids match. This can be easily done with w2socreforecastll. Simply specify which grid you would like the other to be remapped to with the -R flag in the command line. 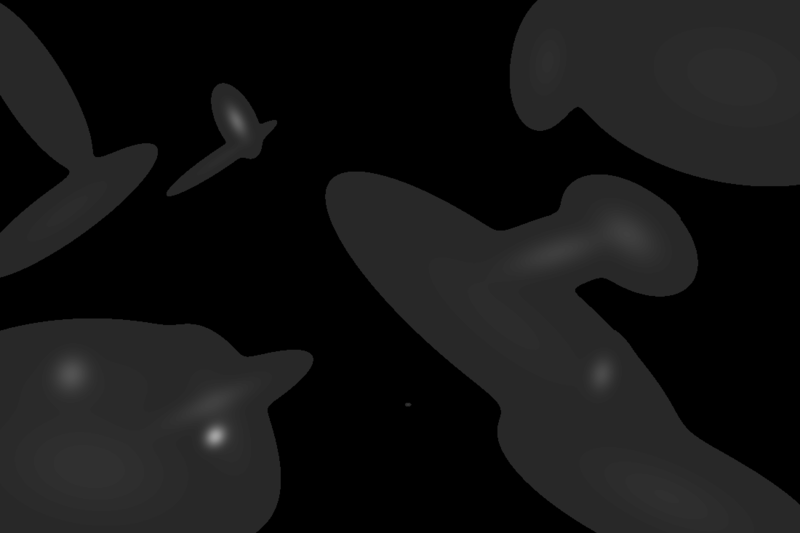 In the images above, the HRRR field was remapped to match the domain of the radar field, and then the Gaussians were created. Going through this output, we first see that we are on iteration number 17, where each iteration is associated with a new timestep. Next we see that we are comparing the 180 minute HRRR created at 20130613-170000 and the radar composite reflectivity at 20130613-200000. Finally we have the error scores for each scale. There is a section of the output file like the one above for each timestep. At the end of the file, all of the error score are aggregated (not shown). This type of information is particularly valuable in situations where you want to compare different forecasts. Perhaps you want to know if at a particular forecast hour, you get a better forecast from advecting radar data forward in time or from the HRRR. With w2scoreforecastll, you can score both forecasts to determine which one is better. Posted in News on April 9, 2014 by Lak. 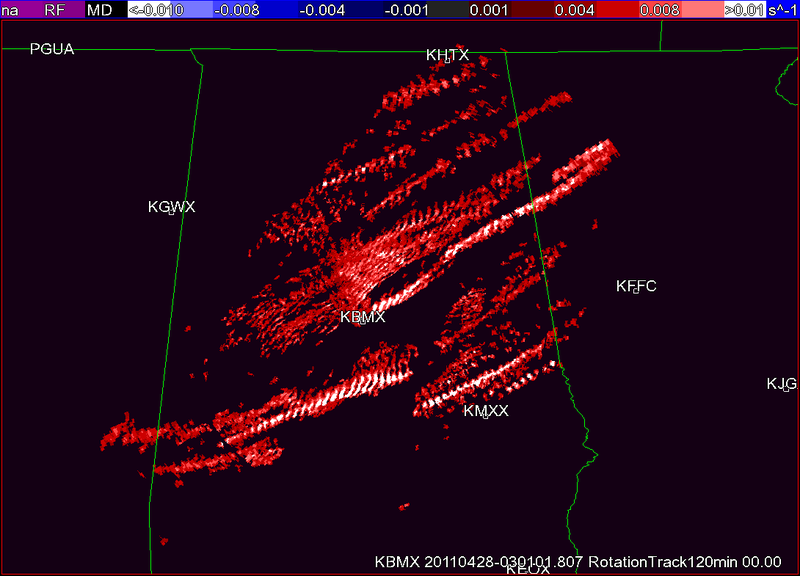 How do you go about creating rotation tracks starting from Level-II radar data from NCDC? If you use Rotation Tracks in your research, please cite the above paper and also cite the papers for each of the following steps. Decide where you want your output products to go. Let’s call this DATADIR. Here’s a script that will carry out the entire process. Edit as needed. # M. Miller, V. Lakshmanan, and T. Smith, ``An automated method for depicting mesocyclone paths and intensities,'' Wea. Forecasting, vol. 28, pp. 570-585, 2013. # V. Lakshmanan, T. Smith, G. J. Stumpf, and K. Hondl, ``The warning decision support system - integrated information,'' Wea. Forecasting, vol. 22, no. 3, pp. 596-612, 2007. # V. Lakshmanan, C. Karstens, J. Krause, and L. Tang, ``Quality control of weather radar data using polarimetric variables,'' J. Atm. Ocea. Tech., vol. 0, p. 0, 2013. # V. Lakshmanan, T. Smith, K. Hondl, G. J. Stumpf, and A. Witt, ``A real-time, three dimensional, rapidly updating, heterogeneous radar merger technique for reflectivity, velocity and derived products,'' Wea. Forecasting, vol. 21, no. 5, pp. 802-823, 2006. # V. Lakshmanan and T. W. Humphrey, ``A MapReduce technique to mosaic continental-scale weather radar data in real-time,'' IEEE J. of Select Topics in Appl. Earth Obs. and Remote Sensing, vol. 0, no. 0, 2013. # V. Lakshmanan, M. Miller, and T. Smith, ``Quality control of accumulated fields by applying spatial and temporal constraints,'' J. Atmos. Ocean. Tech., vol. 30, pp. 745-757, 2013. Posted in Tips on March 25, 2014 by Lak. w2polygon2csv is a very useful WDSS-II tool for researchers. This post shows an example of how to use it. 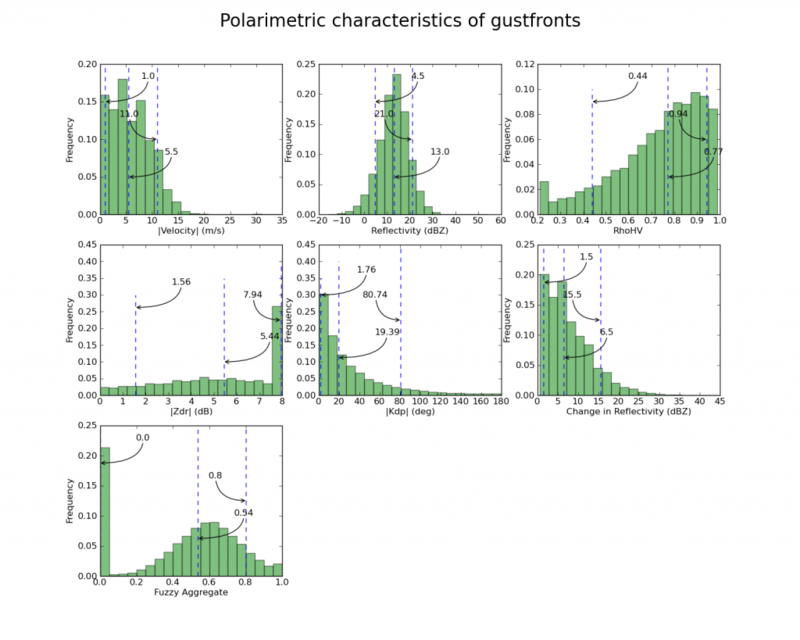 The question I want to answer: “What are the polarimetric characteristics of gust fronts”? I downloaded the necessary Level-II data from NCDC’s HAS website , untarred it and put it all in a directory named “raw”. The directory listing looks like this. Note that I have put all the files (even those from different radars) into the same directory. After this, you will have a directory called KOUN/netcdf within which will be netcdf files corresponding to Reflectivity, Zdr, etc. At this point, a polygon XML file is written to the output directory. 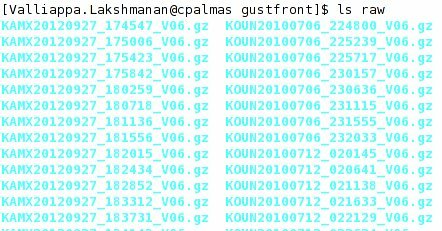 It will have a name like GustFront_Reflectivity_20120709-003408.xml where GustFront is the name of the data source in wg, Reflectivity the name of the product and the rest of the filename is the time stamp. Move to the next image, click Reset to clear the existing polygon from the display and draw the set of polygons corresponding to the new time step. Repeat for all your data cases (you can skip time steps if you want). It is helpful to extract data both from within the polygons (“gustfronts”) and from outside the polygons (“not gustfronts”). The raw data that I want to collect are Reflectivity, AliasedVelocity, RhoHV and Zdr. I can also collect any other data as long as I have an algorithm that will produce that data in polar format. After the above commands are run, we will have a set of comma-separated-values (CSV) files in csv/gf corresponding to gustfronts and another set of CSV files corresponding to not-gustfronts in csv/ngf. The very first line (head) simply carries over the column information from the original CSV files. The reason for the “grep -v” on the second and third lines is to remove this header line from all subsequent output. At this point, you will now have a “train.csv” with all the pixel data and you can use R’s read.csv to read it and process it. You may notice that I have additional columns in my output — I used existing WDSS-II tools (beyond the scope of this blog) to produce a ChangeInReflectivity (over time) and to approximate the Kdp. You could use R itself to draw histograms, but these days, I prefer using Python, and so I will read the individual files from within the Python program itself. My Python program, for simplicity, will read and plot only the gustfront csv files (repeat for the non-gustfront data). As I read in the data, I append it to an array called “alldata”, so at the end of the loop, my “alldata” contains all the valid (non-missing) data in the CSV files. Posted in Tips on March 24, 2014 by Ben Herzog. In order to run the hydrometer classification algorithm (HCA) and melting layer detection algorithm (MLDA) in w2dualpol, a “first guess” at the melting layer is required. Previously, the same default first guess was used for all radars. Obviously this solution is not ideal, as on any given day, the melting layer is likely to vary wildly across different radar sites (not to mention that at any given radar site, the melting layer is likely to vary wildly across different days). For a better solution, you can now pull environmental information (specifically, the 0C wet bulb temperature height) into w2dualpol for a more realistic first guess at the melting layer. This first guess is provided through the use of a SoundingTable. The SoundingTable can be created in one of three ways: (1) The WDSS-II program nse can create this from a RUC analysis field. (2) The ingest_sounding.pl script reads and converts sounding data from the U. Wyoming website into WDSS-II’s XML format. (3) You can write your own XML table file. Once you have your SoundingTable, you will want to be sure that it is included in your RadarIndex. Then, in the command for w2dualpol, set the -S flag, and from there the algorithm will use the SoundingTable information to create a first guess at a melting layer. 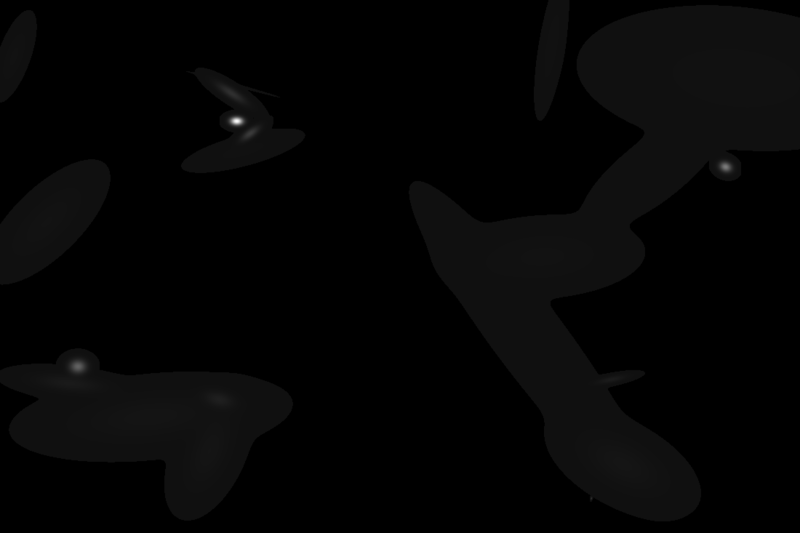 Additionally, the melting layer found from the SoundingTable will be used in instances when the data is not sufficient for the MLDA to run. It should be noted that once the SoundingTable is greater than 1 day older than the radar data being processed, the SoundingTable will be aged off and the default melting layer will be used. 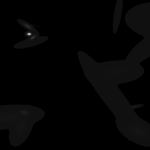 On a related note, we have altered the algorithm such that if more than two hours pass after the MLDA has run, the algorithm will revert to using the melting layer found in the SoundingTable. A few final notes; If a SoundingTable is present in the RadarIndex but you do not wish to use it, set -S junk and the default value will be used for the melting layer. Additionally, if no SoundingTable is available, there is no need to set -S.
A secondary use of weather radars is to detect biological scatterers such as birds, bats, and insects. When birds are detected, the echoes returned to the radar can be used to estimate the density of birds on the ground. This information is valuable in a number of situations, such as when attempting to determine where birds stop while in their migratory journey. The algorithm w2birddensity, which is based on an algorithm described in detail here, estimates the bird density from radar reflectivity data. This is done by computing a vertical profile of reflectivity (VPR) and making adjustments to the raw reflectivity field based off of the VPR. 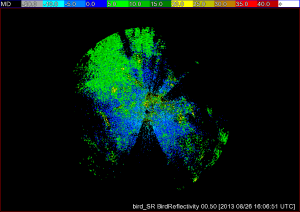 Previously, w2birddensity was carried out at a fixed resolution, but we have now given users the option of defining the resolution of their radar data with the -R flag. As with many of our other algorithms, just specify the gate size in km, the radial size in degrees, and the range in km, as shown below. Additionally, we have given the user the option of specifying that they would like more then the default of 5 tilts processed. This is done by setting the -n flag to the number of tilts desired. Bird reflectivity from KIWA at super-resolution. Bird reflectivity from KIWA at legacy resolution.